The Spice House’s Argyle Street Asian Blend is a terrific combination of Thai-oriented ingredients (but will nicely accent many other recipes): Lemon grass, cilantro, coriander, chile peppers, garlic, ginger, onion, white pepper, and sesame seeds. This roasted chicken truly benefits from this spice blend: The flavors mingle well with the simple oil and soy sauce rub, and the spices and sesame seeds brown up quite nicely. Spatchcocking the bird for roasting allows for more even cooking and browning, making for a beautiful presentation. 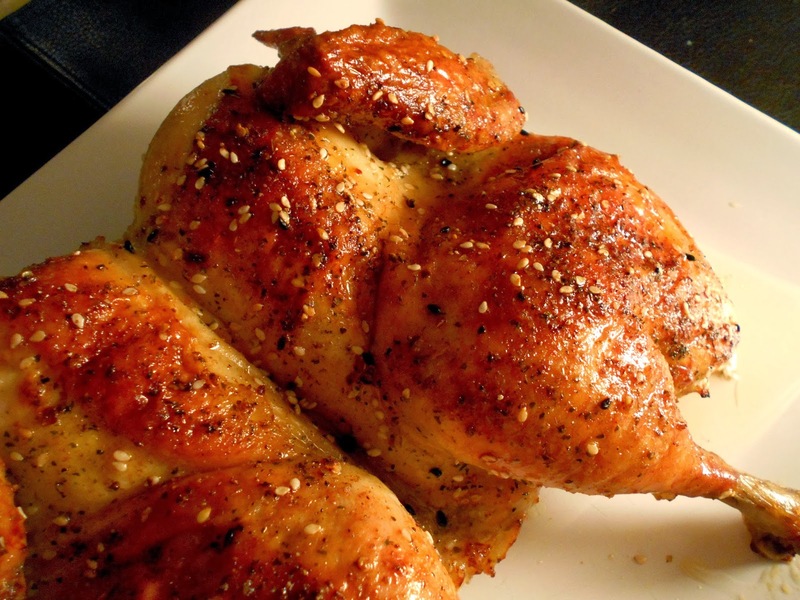 The result is a delicious take on your everyday roasted chicken! Preheat oven to 375°F. Prepare roasting pan by lining with foil, and spraying rack with cooking spray. Spatchcock the chicken: Cut down the back bone of the chicken. Lay chicken out, skin side down. Press chicken out flat on either side of back bone, exposing breast. Press down along either side of the breast bone, removing it and the attached cartilage. Remove chicken to platter; let rest for 10 minutes. Cut into pieces and serve.